Y. C. Eldar and G. Kutyniok, "Compressed Sensing: Theory and Applications", Cambridge University Press, May 2012. 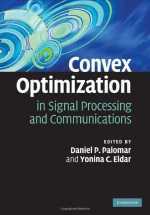 D. P. Palomar, Y. C. Eldar, "Convex Optimization in Signal Processing and Communications", Cambridge University Press, 2010. 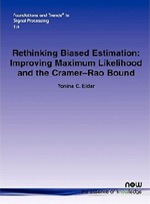 Y. C. Eldar, "Rethinking Biased Estimation: Improving Maximum Likelihood and the Cramèr-Rao Bound", Foundations and Trends in Signal Processing, Vol. 1, No. 4, pp. 305–449, 2008. A. Kipnis, Y. C. Eldar and A. Goldsmith, "An Information Theoretic Approach to Analog-to-Digital Compression", in Information-Theoretic Methods in Data Science, 2019. K. V. Mishra and Y. C. Eldar, "Sub-Nyquist Radar: Principles and Prototypes", Compressed Sensing in Radar Signal Processing, Cambridge University Press, 2018. T. Bendory, R. Beinert and Y. C. Eldar, "Fourier Phase Retrieval: Uniqueness and Algorithms", Compressed Sensing and its Applications, pp. 55-91. Birkhäuser, Cham, 2017. D. Cohen, S. Tsiper and Y. C. Eldar, "Analog to Digital Cognitive Radio", Handbook of Cognitive Radio, Edited by W. Zhang, The University of New South Wales, 2017, ch. 7. K. Jaganathan, Y. C. Eldar and B. Hassibi, "Phase Retrieval: An Overview of Recent Developments", Optical Compressive Imaging, Edited by A. Stern, CRC Press, 2016, pp. 263-287. Y. C. Eldar, "Compressed Sensing", The Princeton Companion to Applied Mathematics edited by Nicholas J. Higham, Mark Dennis, Paul Glendinning, Paul Martin, Fadil Santosa and Jared Tanner, Princeton University Press, 2015, pp. 823-827. 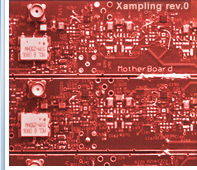 M. Mishali and Y. C. Eldar, "Xampling: Compressed Sensing for Analog Signals", Compressed Sensing: Theory and Applications, Edited by Y. C. Eldar and G. Kutyniok, Cambridge University Press, 2012, pp. 88-147. 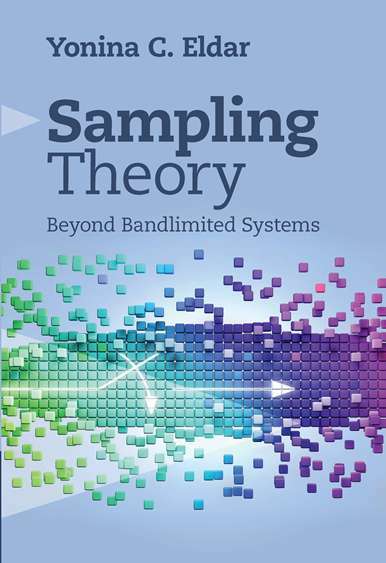 J. Uriguen, Y. C. Eldar, P. L. Dragotti and Z. Ben-Haim, "Sampling at the Rate of Innovation: Theory and Applications", Compressed Sensing: Theory and Applications, Edited by Y. C. Eldar and G. Kutyniok, Cambridge University Press, 2012, pp. 148-209. M. A. Davenport, M. F. Duarte, Y. C. Eldar and G. Kutyniok, "Introduction to Compressed Sensing", Compressed Sensing: Theory and Applications, Edited by Y. C. Eldar and G. Kutyniok, Cambridge University Press, 2012, pp. 1-64. T. Michaeli and Y. C. Eldar, "Optimization Techniques in Modern Sampling Theory", Convex Optimization in Signal Processing and Communications, Edited by Y. C. Eldar and D. P. Palomar, Cambridge University Press, 2010, pp. 266-314. Y. C. Eldar and A. Nehorai, "Mean-Squared Error Beamforming for Signal Estimation: A Competitive Approach", Robust Adaptive Beamforming, Edited by J. Li and P. Stoica, Hoboken, NJ: John Wiley & Sons, INC., 2006, pp. 259-298. Y. C. Eldar, "Sampling Without Input Constraints: Consistent Reconstruction In Arbitrary Spaces", Sampling, Wavelets and Tomography, Edited by A. Zayed and J. J. Benedetto, Boston, MA: Birkhäuser, 2003, pp. 33-60.